On Saturday 18 November Sustrans held their annual regional meet-up. The meeting was well attended and was a great opportunity to network with other Sustrans volunteers as well as to gather useful information. Bob Steele (Mid-Somerset co-ordinator) gave a presentation about the work of the group which was well received. There was also a presentation about the Taunton Project from Ruby Tobin. Representatives of Sustrans, including James Cleeton, Regional Director, reminded and inspired all attendees about the core aims of Sustrans as well as issues around land and the cycle network management. A workshop covering the planning process and how to influence planning decisions was also held. 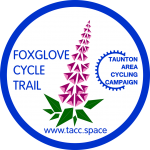 The day finished with a ride around the Taunton Foxglove Cycle Trail led by Mike Ginger of TACC. It was a great opportunity to test the trail on another group of people and the response was very positive. Even people who have lived locally for years said that they were discovering green spaces that they didn’t know existed. TACC have funding for the way marking and we are now seeking funding to produce a map of the route together with a sizeable print run with a launch date hopefully achievable by Spring 2018. This is supported by Visit Taunton who receive lots of requests for cycling information. For a map of the Foxglove Cycle Trail click here.